Colombia’s president, Juan Manuel Santos, has signed a peace deal with the Revolutionary Armed Forces of Colombia (or FARC), ending the longest war in the Americas. Signed using a pen made from a bullet in the Caribbean city of Cartagena, the agreement formally ends 52 years of bitter conflict which has left 260,000 dead and nearly 7 million displaced, with state aligned paramilitaries contributing to the violence. The FARC, Latin America’s last insurgency with a nationwide reach, took up arms in 1964 in defence of the country’s vulnerable peasant population but later turned to the drug trade, kidnapping, and extortion to fund their political ambitions. Following a decade of sustained US-backed military offensives that left them weakened, the rebels were led from the jungle to the negotiating table in 2012. 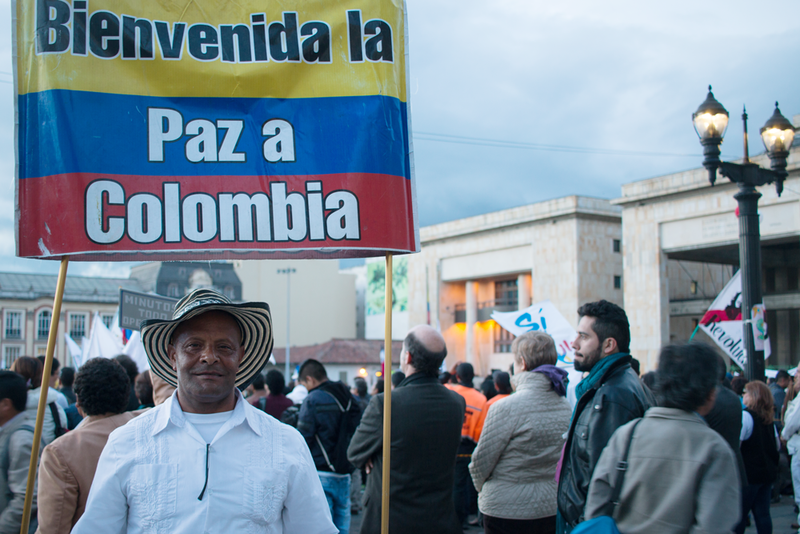 After four years of tense negotiations, the peace deal includes accords on rural reform, combatting the drug trade, reparations for victims, transitional justice, and political participation for the 7,000 rebels. 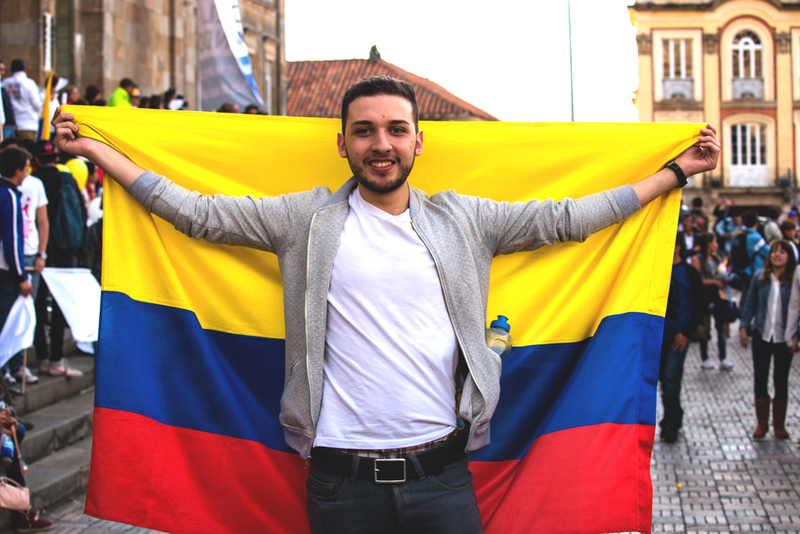 Though the agreement still needs to be ratified by a national referendum, in Bogotá, Colombia’s capital, people took to the streets to celebrate a step towards lasting peace in a country that has only known war for generations. Little Atoms asked them about their hopes for peace. 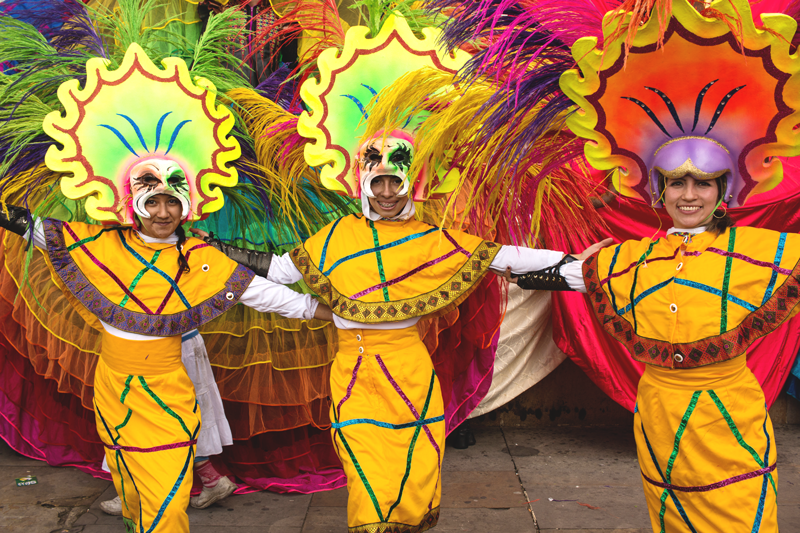 A group of traditional Colombian carnaval dancers join the thousands of people celebrating the end of the longest war in the Americas. Carla, 51, who did not want her surname published, will be voting No in Sunday’s referendum. 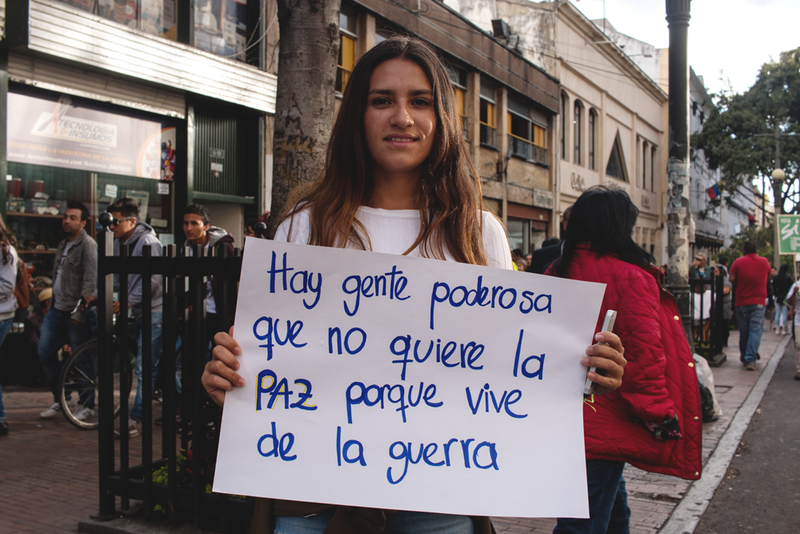 “Every human being wants peace, but not a false peace.” The No campaign is led by hardline former president Álvaro Uribe, who built his presidency on a brutal military campaign against the FARC. Uribe is currently under investigation for involvement in paramilitary massacres but remains a popular figure in Colombia’s divided political landscape. 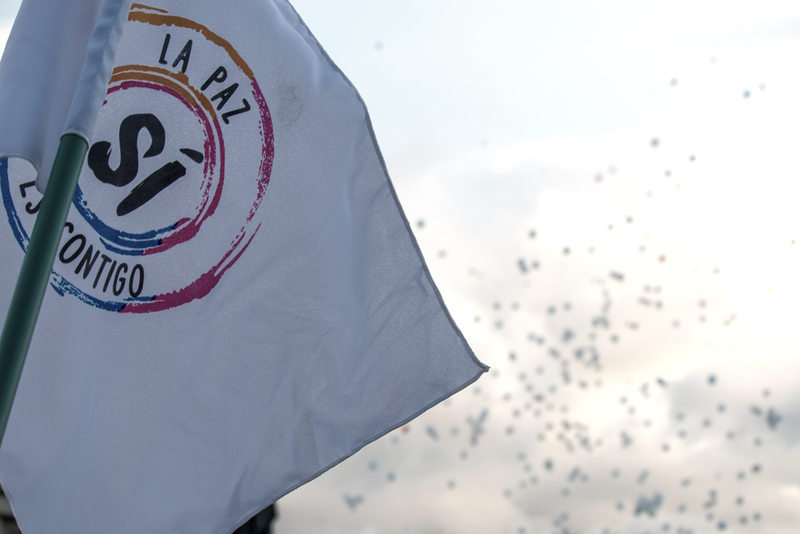 Many are opposed to the deal because they feel the FARC should answer for their crimes. 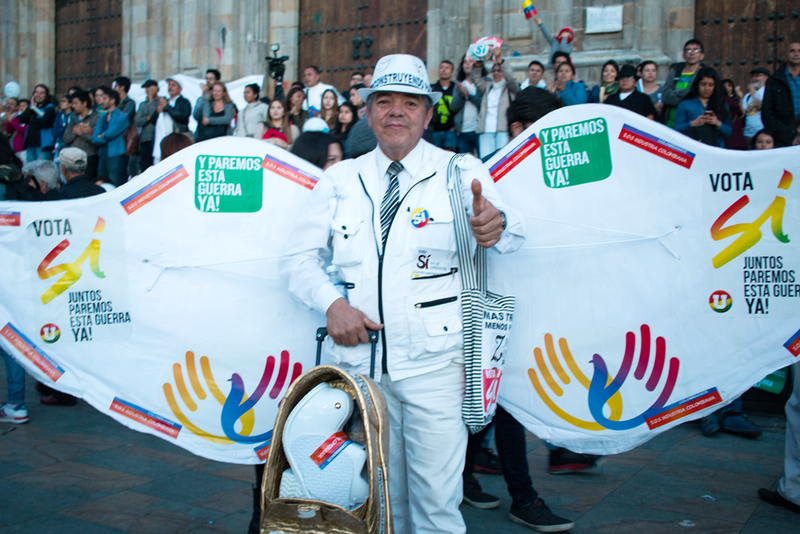 Supporters of the Yes campaign wave signs in front of Bogotá’s cathedral. 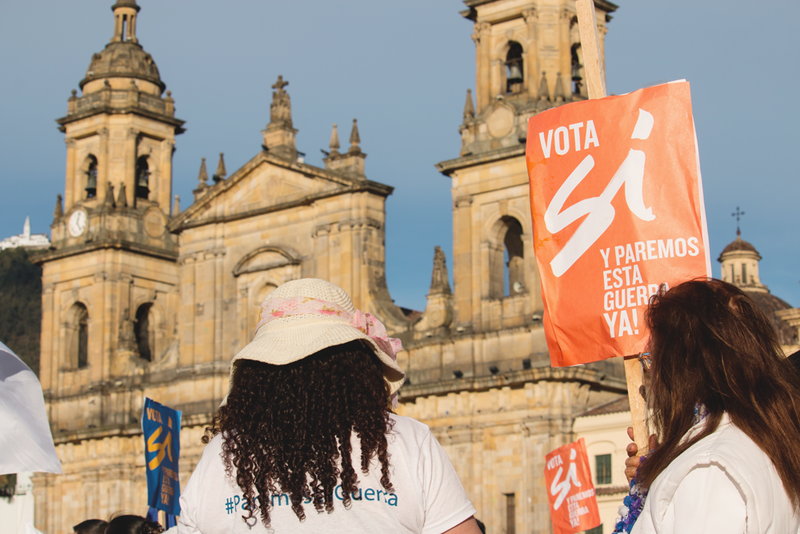 Though demonstrations across the country reflected the support for both campaigns, in the capital the mood was celebratory, with many more Yes voters taking to the streets. 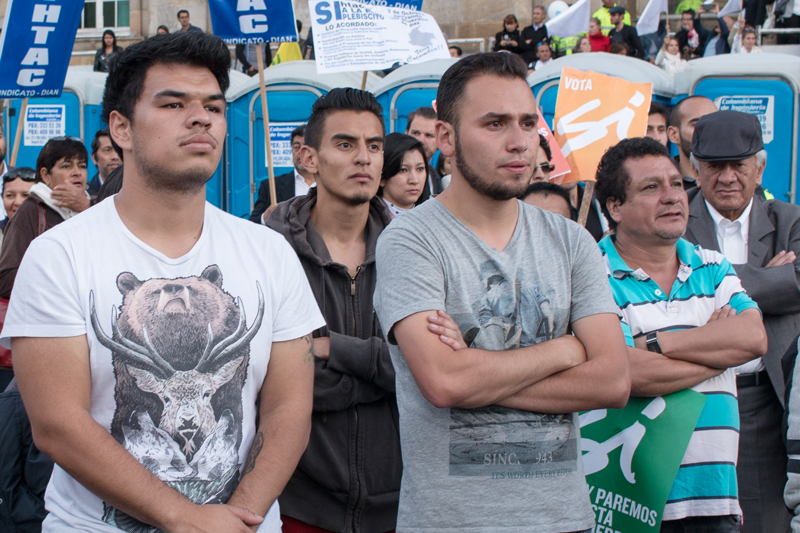 No campaigners outside Bolívar square complained they were denied entry by police. 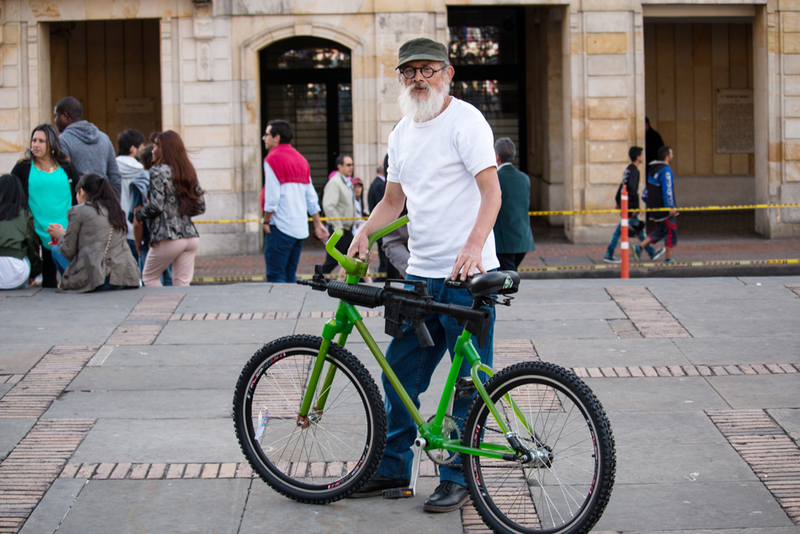 Carlos Ruiz, 63, poses with his bicycle modified with a model M16 assault rifle. “There are many uses for guns, but I think the best is a bike,” he told Little Atoms. Ruiz says he will vote Yes in Sunday’s referendum. Polls were close until a recent poll predicted a comfortable win for the Yes camp. 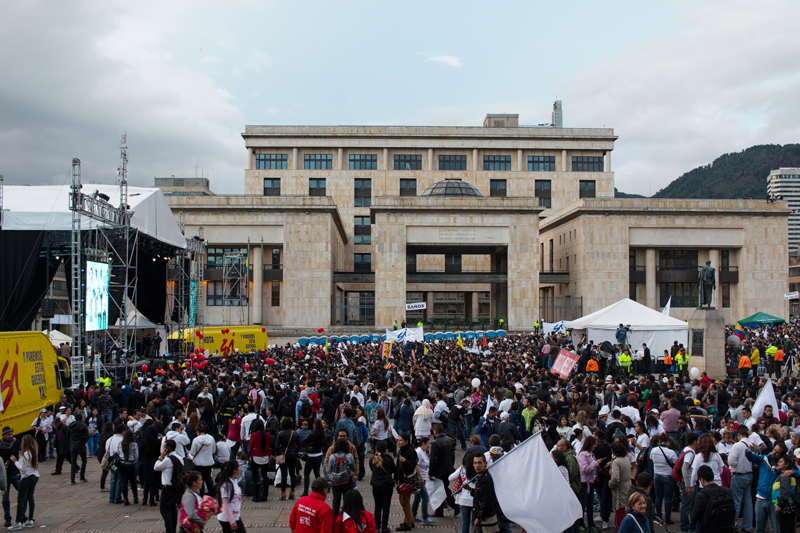 Crowds gather in Bogotá’s historic Bolívar Square, in front of the Palace of Justice. In 1985 the palace housed one of the darkest chapters in the history of the conflict when then the now-demobilised M-19 guerrilla group took over the building and held 300 people hostage. The following military raid left 98 dead, 11 of whom were judges. 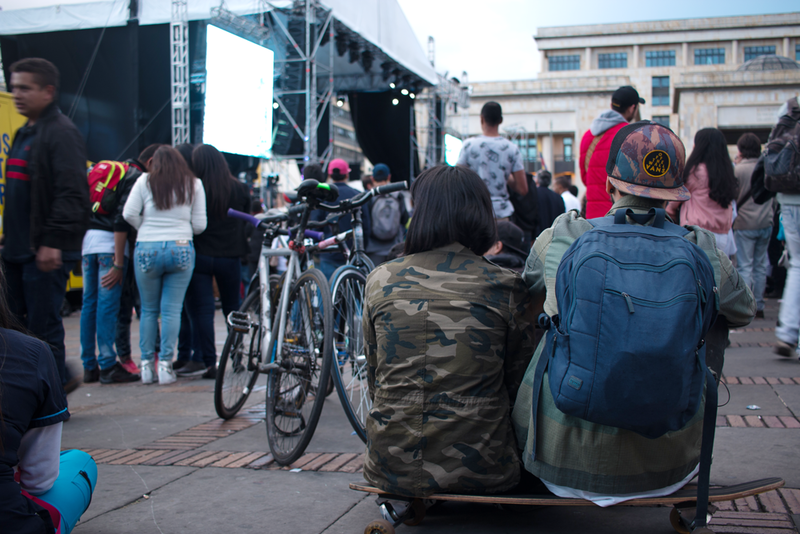 A young couple sits on a skateboard to watch the Cartagena signing ceremony live on a big screen. Since the war began in 1964, the conflict has seen many failed peace processes. 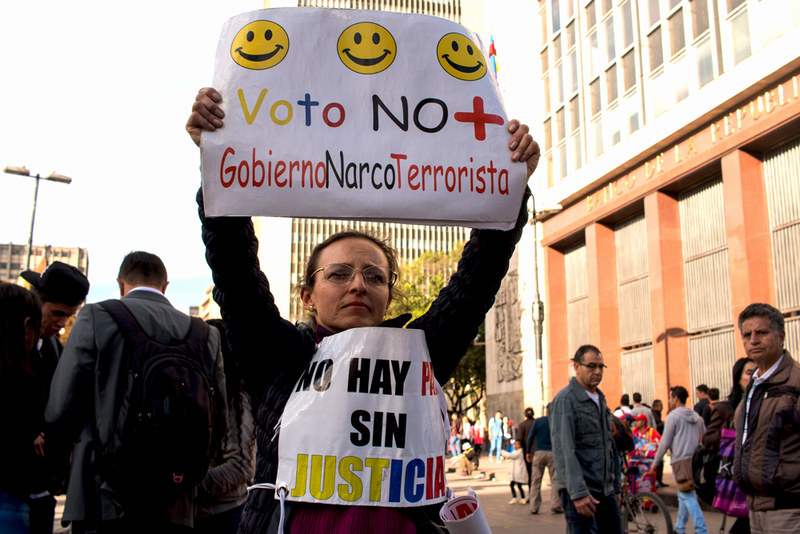 While many Colombians believe too many concessions have been given to the FARC – who remain on the US international terror watch list – the accord is widely expected to be approved in Sunday’s national referendum. 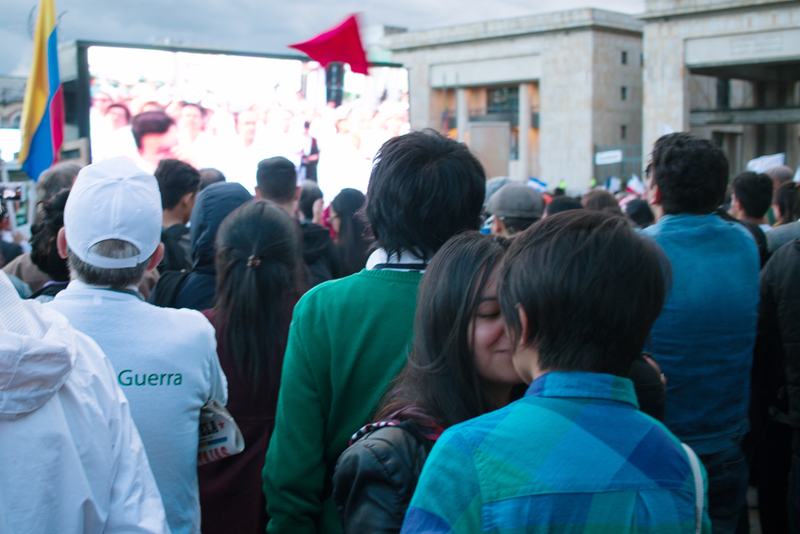 A couple kiss during a speech by FARC commander Ricardo Londoño, AKA Timochenko. "Our only weapons will be our words”, the Marxist leader said in Cartagena following the signing of the deal. 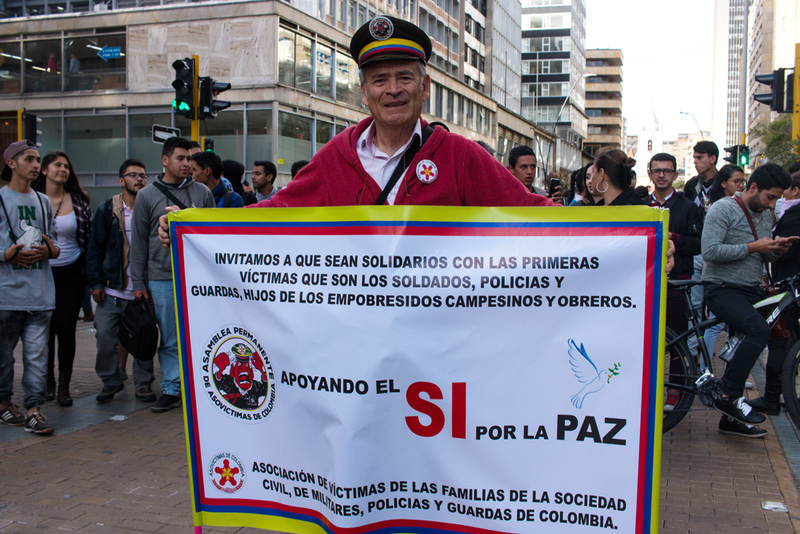 “In the name of the FARC I sincerely ask for forgiveness to all the victims of the conflict and for all the pain we might have caused.” If the deal is approved, the rebels will head to designated demobilisation zones to turn over their weapons to a United Nations monitoring mission. Ramón Marín, 52, saw his family torn apart when his brother was kidnapped by the FARC in 1985. Marín’s message is one of forgiveness. “You have to release the hatred from your soul and open the door to forgiveness. That way we bring prosperity to the country." Family members who have had loved ones disappeared by both state and guerrilla forces attend a public screening of the signing ceremony. 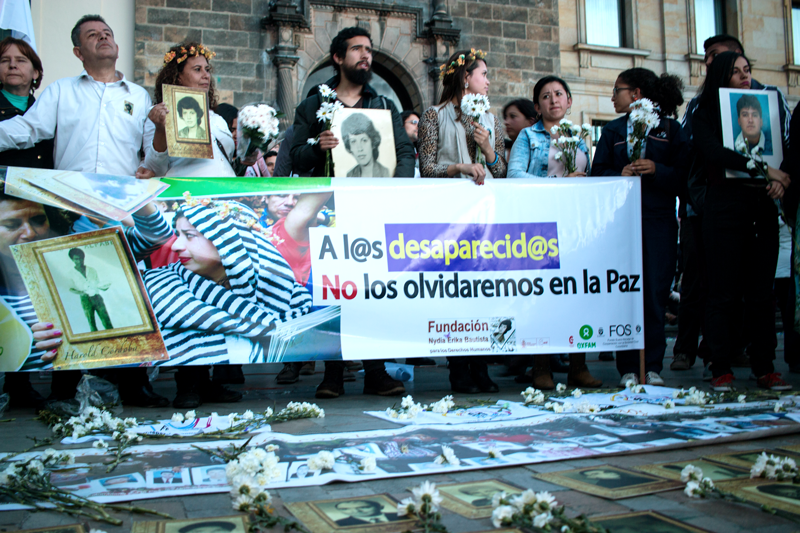 Their sign reads, “To the disappeared: we will not forget you in peace,” Since the conflict began, at least 45,000 people have disappeared. The deal promises a bilateral search team for missing bodies. Joe Parkin Daniels is a British journalist and photographer based in Bogotá, Colombia, where he covers human rights, the country's internal conflict, and health. His work has appeared at VICE News, The Lancet, and the Christian Science Monitor.